Blackmore's Night are readying the follow-up to 2013's Dancer and the Moon. The band's label, Frontiers, has announced a Sept. 18 arrival for the group's new LP, titled All Our Yesterdays. 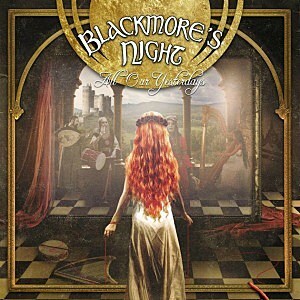 Blackmore's Night have yet to confirm a track listing for the album, but plans call for a standard CD edition as well as a deluxe CD/DVD package, with a vinyl version slated for later in the year. All Our Yesterdays marks the 10th studio outing for Blackmore's Night, who made their debut with 1997's Shadow of the Moon. According to the band's website, it will be just one of several group-affiliated releases in 2015; this fall, there's reportedly a documentary offering a look at guitarist Ritchie Blackmore's "musical journey," as well as a new album of lullabies from singer Candice Night. Blackmore's Night's announcement comes weeks after Blackmore's former Rainbow bandmate Joe Lynn Turner asserted that a reunion of that band was "probable." According to Turner, "He’s itching to do some rocking, and we’re going to get together in the fall. Ritchie is really, really ready to rock. He still has the chops, too." Whether All Our Yesterdays throws a wrench in Turner's Rainbow plans remains to be seen, but in the meantime, Blackmore's Night will be on the road this summer — the band members are scheduled to play a series of dates in France, Germany, and the Czech Republic during the month of July.